A test of the latest set of client changes is currently ongoing. Accidentally a batch of faulty workunits were sent out during the night (UTC). These will stall at 98.5%. If you get such a WU please abort it. Workunits that stall at 0.01% should not be aborted unless they stall for more than 30 mins. 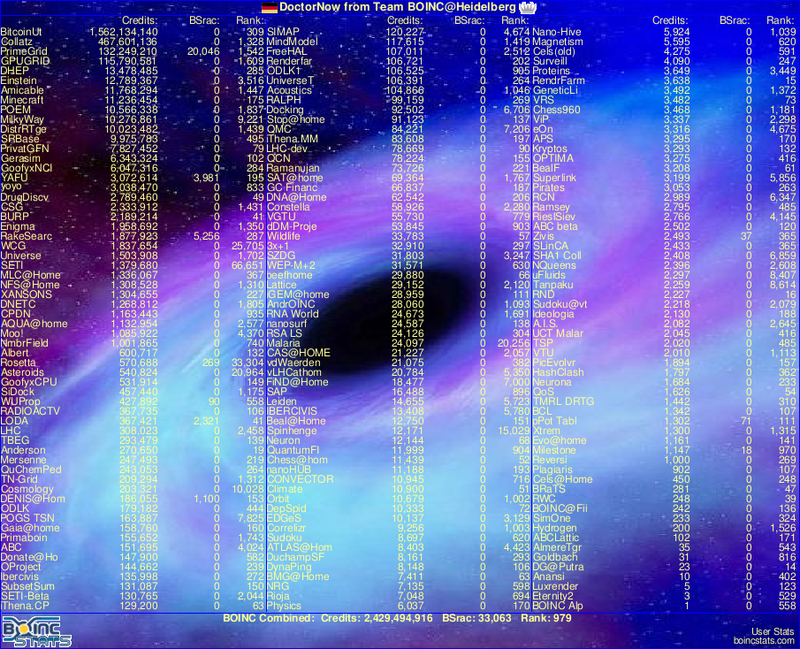 So ein Dreck, mein zweiter PC hat vier BURP-WUs gezogen und alle defekt: http://burp.boinc.dk/results.php?hostid=10773 ... Da steht zwar, die seien alle nur unter 10sec gelaufen, dem ist aber nicht so. Mindestens zwei Stunden habe ich somit verschwendet. Hab BURP auf "keine neue Arbeit" gestellt. 10/02/2011 11:08:18 BURP Message from server: SunflowerBlender needs 14685.02MB more disk space. You currently have 7965.98 MB available and it needs 22651.00 MB. Originally the movie was only rendered for standard HD screens. We are going to re-render BBB in cinema quality 4k HDRI, 60 fps, 3D stereo! We continuously invest in ways to improve our search engine and have discovered the great potential in 3D graphics for presenting search results. No other search engine currently on the market is able to present top hits rendered in full 3D! BURP will be used to render live previews of websites into 3D images and animations that will then be displayed as search results. It will still be possible for the community to render other things on BURP but the results will include small advertisements embedded into the video based on Google AdSense. Hopefully this will not be an issue to anyone. Bevor jemand Ergebnisse melden will, die nicht akzeptiert werden, muss zuerst der Account zu beta umgewandelt werden. Das geht ganz einfach über die Startseite und "upgrade zu beta". Seit 3 Tagen kann man bei BURP mit Nividia-Karten den CUDA-Blender testen. Wer von euch einen Mac sein eigen nennt, kann jetzt mithelfen, die neue App zu testen. Einen Thread dazu gibt's hier.